"The Commissar Vanishes is an installation of haunting images from the David King Collection, which coincides with the Russian publication of the book of the same name that traces the falsification of photographs and art in Stalin's Russia. Like their counterparts in Hollywood, photographic retouchers in Soviet Russia spent long hours smoothing out the blemishes of imperfect complexions, helping the camera to falsify reality. But it was during the Great Purges, which raged in the late 1930's, that a new form of falsification emerged. The physical eradication of Stalin's political opponents at the hands of the secret police was swiftly followed by their obliteration from all forms of pictorial existence. Photographs for publication were retouched and restructured with airbrush and scalpel to make once–famous personalities vanish. Entire editions of works by denounced politicians and writers were banished to the closed sections of the state libraries and archives or simply destroyed. 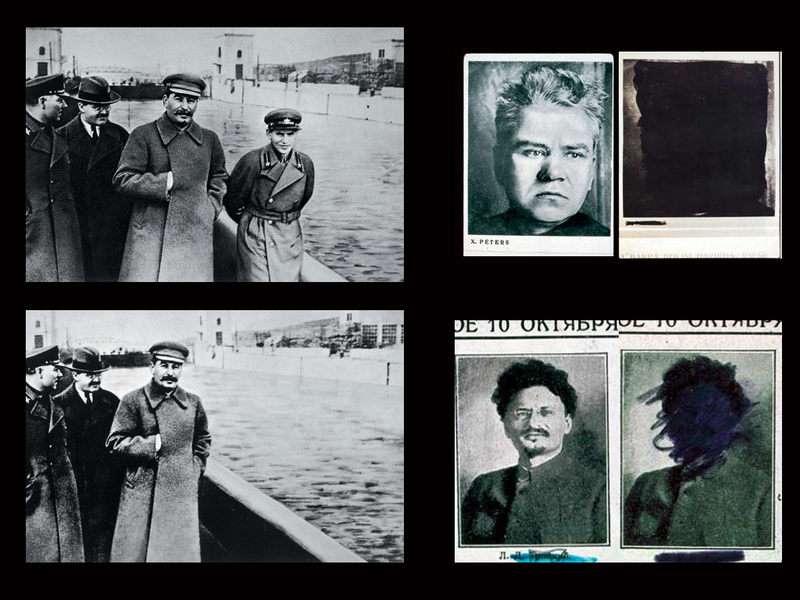 Soviet citizens, fearful of the consequences of being caught in possession of material considered 'anti–Soviet' or 'counterrevolutionary', were forced to deface their own copies of books and photographs. The subject matter of this exhibit focuses on one particularly evocative example: in 1934 the artist/designer/photographer Alexander Rodchenko was commissioned by the state publishing house OGIZ in Moscow to design the album, Ten Years of Uzbekistan, celebrating a decade of Soviet rule in that state. The Russian edition, full of Rodchenko's skillful design techniques, appeared the same year and the Uzbek edition, with some politically induced changes, in 1935. But in 1937, at the height of the terror, Stalin ordered a major overhaul of the Uzbek leadership and heads began to roll. Many Party bosses photographed in Ten Years of Uzbekistan were liquidated. The album suddenly became illegal literature. Using thick black India ink, Rodchenko was compelled to deface his own book. This installation now brings together, in the form of photographic enlargements, the published portraits of the high–ranking officials victimised in Stalin's Uzbek purge, juxtaposed with their eradication by Rodchenko's hand. The macabre results – ethereal, Rothko–like, sometimes brutal and terrifying – came close to creating a new art form, a graphic reflection of the real fate of the victims." David King (1997). "The Commissar Vanishes".